"Didgeridoo Trance Dance" was a real favourite for me. The use of didgeridoos, drums, and traditional chants encompass both a respect for tribal values and tradition in a sound of now style. The artists Gondwana, Ganga Girl, Lost at last, Global, Axis, Andy Graham, Didjworks, Hayan and Si could so easily and should be being picked up by our local djs. Fast minimal techno, bold percussive beats, chilled out house, and trancey vocals are all expertly created from native Australian sounds, Arnhem land voices and tribal percussion instruments such as the djembe, mouthbow and tapan drum. This is a fantastic collection of music that would benefit greatly from being heard by a wider audience. Pumping rhythms of the wild droning, eternal voices of an ancient-future exotic nature sounds and rapid-fire percussion create an inter-dimensional journey into mindless spirit. Multi-layered didgeridu riffs and traditional Arnhem Land voices mixed with dance floor drum'n bass to create an original earth sound. Indigenous technorganica! Fast 150 beats/minute, a song that rocks clubs and dance parties with bush sounds of Australia. A traditional native American peyote chant arranged in a modern style with didgeridoo, trance drums, synthesisers. Fast and joyous 142 BPM trance dance featuring didgeridoo and hooting owl. With its spirited beat and beseeching didge horns, this song is a playful release of energy. A decisive, purposeful dance, out of the shade towards somewhere bright... the future perhaps! 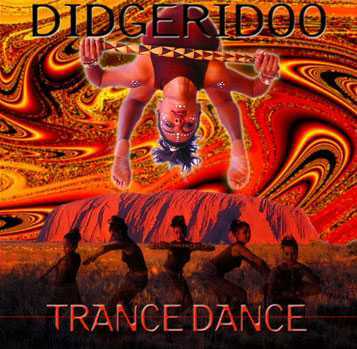 Didgeridoo dance-trance about Australia, an ancient land steeped in mythology and home to the world's older culture, it's "Another Land". High-energy piece featuring the didgeridoo, drumkit and djembe, demonstrating the more masculine side of drumming. Trip-Hop didgeridoo with urban beats, animal sounds, and environmental motives. Traditional African/Caribbean music with percussion, mouthbow and molimo (didgeridoo or 'bamboo')... Let us travel to Kmt (Ancient Egypt). the magic ground of the Pharaohs. A double didgeridoo trance journey - inspiring an infinity of sounds.